Perennial variety of cotton. 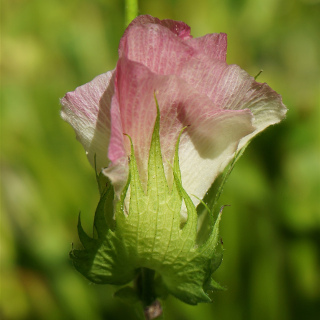 Produces pink-tinged flowers followed by fluffy, white cotton filled bolls during Summer and Autumn. Can be picked, de-seeded and used as cotton balls or just grown as an interesting flowering shrub. 8-9 months to harvest. 18 seeds per packet. This species of cotton is native to Central America. Perennial white cotton produces large showy, hibiscus-like flowers that are followed by green capsular fruit which when ripe split open to reveal seeds surrounded by fluffy, white cotton fibres. The bolls can be de-seeded and used as a home-grown, organic alternative to shop brought cotton balls. These home-grown cotton balls are suitable for make-up removal, cleaning fine surfaces and a myriad of other uses. Perennial cotton requires full sun to grow and produce best. Perennial cotton grows best in fertile soil rich in organic matter. If your soil is sandy, heavy with clay or lacking in organic matter place down a layer of compost or well-rotted manure prior to planting perennial cotton. Top dress around perennial cotton bushes yearly during Spring with a complete organic fertiliser. Perennial cotton bushes will drop their leaves during Winter, but they'll return the following Spring. Water perennial cotton plants if they show signs of heat stress. Perennial white cotton flowers turn from cream-coloured to pink once successful pollination has occurred. Bolls develop and ripen over Summer and Autumn. In temperate regions of Australia sow perennial white cotton seeds during Spring. In frost-free subtropical regions of Australia sow perennial white cotton seeds from late Winter through to late Spring. In tropical regions of Australia sow perennial white cotton seeds either from early to mid Autumn or anytime during Spring. Sow cotton seeds 1.5cm deep spacing plantings at least 40cm apart to give plants room to grow. Perennial white cotton seeds can have slow and erratic germination taking from 7 to 21 days from sowing for seedlings to emerge. Cotton seeds have a hard, black seed coat that resists water. Germination rates for cotton can be improved by soaking the seeds in just boiled water overnight prior to sowing. Perennial cotton plants take between 8 and 9 months to start producing bolls.